Partnering with families of children who are deaf and hard of hearing to develop strong foundations for communication and reading. The Katherine Hamm Center knows every child deserves the joy of learning, the satisfaction of communicating effectively, and the pride of mastery. The key to unlocking that potential begins with early intervention. Hamm Center programs begin in infancy, working closely with families of children who are deaf or hard-of-hearing to develop strong foundations for language: preparing the way for learning, communicating, and reading that continue to be built upon for a lifetime. Children learn language most rapidly in the earliest years of life – while the brain is developing at its fastest rate. The Hamm Center understands the fusion between language heard and language spoken, and its role in literacy and learning. 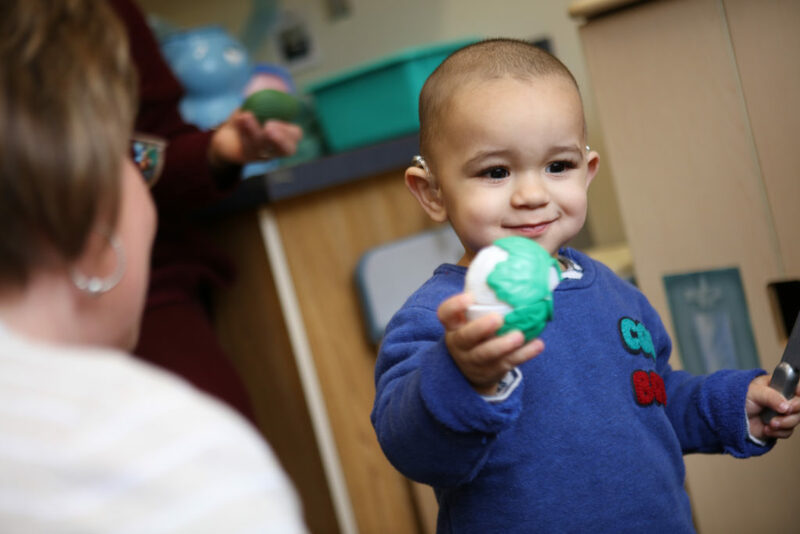 For children who are deaf and hard of hearing, early intervention makes all the difference – which is why Hamm Center programs begin in infancy. The Atlanta Speech School builds the foundations for reading and life-long learning. In each school and program, our classrooms apply a model for reading brain construction developed by the Speech School in alignment with the latest neuro- and social-science. The primary development of a reading brain occurs between birth and three years old. Recognizing the critical nature of brain development, teachers in the Katherine Hamm Center apply research-based strategies to promote early literacy with even the youngest students – and guide them as they develop the language necessary for critical thinking. Children are never silenced at the Atlanta Speech School. Instead, the environment of mutual respect instills in them an expectation of real connection and fulfillment. When we reach children early- especially within the first year of life – we help them develop proficiency in early listening and language that leads to confidence, communication skills and high rates of literacy. At the Hamm Center, we target language development and construction of the foundations for reading – offering our children a path to learning independence and success. Children who are deaf and hard of hearing are often left behind. While currently, in Georgia, only 3% of deaf or hard of hearing children read at grade level, through the efforts of the Hamm Center, we are changing those odds for each child we serve and every child in our state. In Hamm classrooms, there are children who are deaf or hard of hearing working alongside peers with typical hearing, in a rich environment of listening and spoken language. Developing relationships with other children and adults, learning to communicate and practicing conversational partnership are integrated into all aspects of each child’s school day. In addition to academics, our school-age children (3s – 4s) participate in enriching activities that include music, PE, occupational therapy/physical education, art, and media. Classroom teachers collaborate with enrichment teachers to integrate and bolster language development. The Atlanta Speech School’s audiology staff allows us to provide Hamm Center students the services they need to achieve their potential. 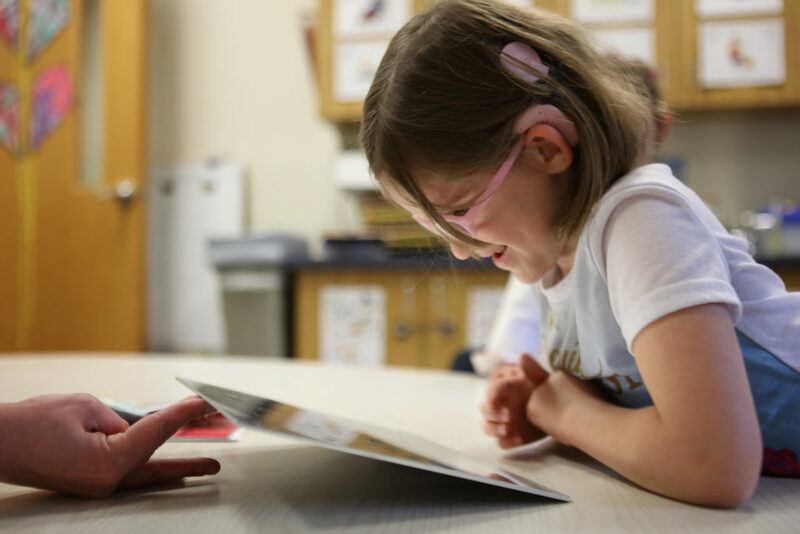 The Hamm Center’s educational audiologist supports hearing technology and conducts assessments to ensure each child has full access to sound. Throughout the Hamm Center, state-of-the-art assistive listening devices are used to assure an optimal listening experience. Katherine Hamm founded The Atlanta Speech School more than 80 years ago, when she moved to Atlanta from St. Louis. Her son, Ben, was deaf, and had learned to speak at a school in St. Louis. Armed with the knowledge of the benefit that language was for her son, Katherine Hamm started her free school with the belief that every child should have that same opportunity: the unlocking of language. Today, the Katherine Hamm Center continues that mission, giving each child a voice. Many of our students and their families rely on the generosity and support of their community to access this learning, and we welcome you to join us in our mission to instill a lifetime of language in these students.